Yesterday, the Journal of Midwifery &Women’s Health published “Outcomes of Care for 16,924 Planned Home Births in the United States: The Midwives Alliance of North America, Statistics Project, 2004 to 2009” by Cheyney, et. al. ✦ This study reports maternal and neonatal outcomes for women planning to give birth at home under midwife-led care, as recorded in the Midwives Alliance of North America Statistics Project dataset (version 2.0, birth years 2004-2009). ✦ Among 16,924 women planning a home birth at the onset of labor, 94% had a vaginal birth, and fewer than 5% required oxytocin augmentation or epidural analgesia. ✦ Eleven percent of women who went into labor intending to give birth at home transferred to the hospital during labor; failure to progress was the primary reason for intrapartum transfer. ✦ Nearly 1100 women attempted a vaginal birth after cesarean (VBAC) in this sample, with a total VBAC success rate of 87%. ✦ Rates of cesarean, low 5-minute Apgar score ( 7), intact perineum, breastfeeding, and intrapartum and early neonatal mortality for this sample are all consistent with reported outcomes from the best available population-based, observational studies of planned home births. The conclusions of the study shared that “Low-risk women in this sample experienced high rates of normal physiologic birth and very low rates of operative birth and interventions, with no concomitant increase in adverse events.” Simply put: home birth with a low-risk, healthy woman pregnant with one, head-down baby is as safe here in the U.S. as it is elsewhere in the world where midwifery care is the standard obstetric care model. This is all awesome news for women who choose home birth- we now have data that supports the stories of a majority of women who choose to deliver at home under the care of a midwife. But, of course, we’re also hearing the protests of ‘the usual suspects’. People have tremendously strong feelings about where women choose to deliver- women who support home birth can, at times, spit venom toward OBs and hospitals as if every doctor out there is ready to get a court order to line his pocket with all that sweet, sweet cesarean money. Those who do not support home birth act as if midwives paint themselves in cow dung and witch-doctor feathers before hypnotizing poor, simple ‘woo drunk’ birth junkies into their death clutches. This doesn’t do anyone justice. Home birth critics are concerned about the lives of women and babies. I get it. I hope that they now have some good data to see what actually IS happening and to make some thoughtful, sane suggestions about how home birth can improve (because we all have room for improvement). Hospital critics are concerned about the dehumanization of women in the birthing room, the usurpation of women’s autonomy in their medical decisions. This is basic human rights. Let’s look at the big picture. What do we ALL want to see happen? Safe, respectful, women-centered care wherever women choose to have their children. So can I make a radical suggestion? Let’s focus on improving maternal-child health overall in this country. Let’s put our weight behind amazing organizations like Improving Birth which is working to create safer, more respectful, more evidenced-based care within the hospital setting. No matter which side of the birthing bed you fall on, how women are treated in the hospital really matters for us all. And if you are concerned about home birth safety, why not work with and/or for your local midwifery association? Ask hard questions with an open heart. How about supporting legislation in your state for safe, reasonable midwifery care? Let’s actually work to improve the system overall- and then maybe women will be able to make the decision that’s right for them without having to worry about how safe or how evidenced-based or how respectful their care will be. They’ll be able to choose safe, appropriate care- wherever they wish to birth their children. 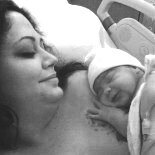 This entry was posted on January 31, 2014 by hearthsidematernityservices in Justice Issues and tagged birth, home birth, hospital birth, MANA Stats, maternity care.